ISIS continues to suffer humiliating territorial losses in the eastern Aleppo countryside as the Syrian Arab Army (SAA) took control of six new villages on Monday. Supported by some 220 artillery strikes over the past 24 hours, the SAA’s seasoned Tiger Forces were able to impose full control over the villages of Al-Arida, Ghadini, Al-Ashini, Rasm Al-Hamam, Abou Jadha, and Tanouza. ISIS was given no safe haven in the Aleppo governorate as Russian jets and Syrian choppers constantly hunted them down, killing too many jihadist militants to count. In total, 115 airstrikes struck ISIS controlled areas in rural Aleppo. Effectively, government forces are just 6 kilometers from the Al-Jarrah Airbase which has been under insurgent control since early 2013. 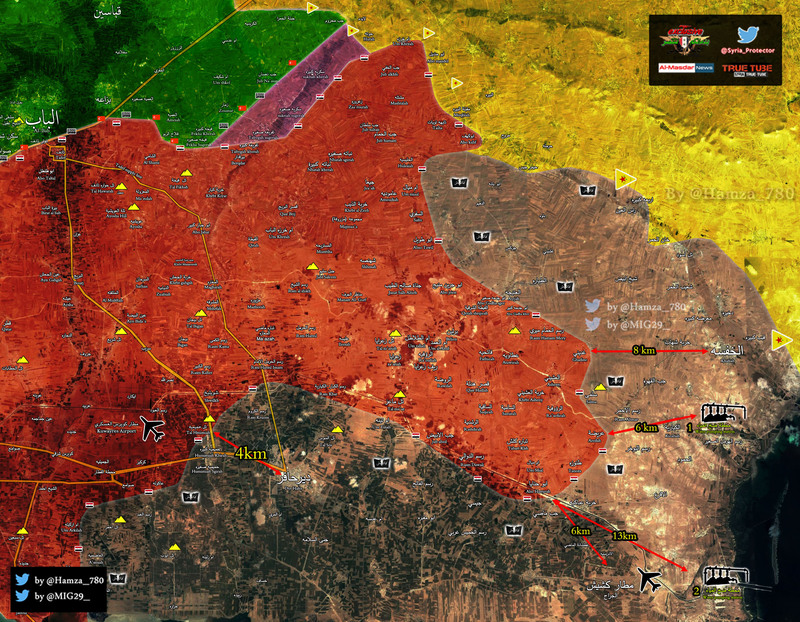 However, the primary goal of the Tiger Forces offensive is likely Al-Khafsa. This ISIS-held town houses the main water facility supplying Aleppo province with drinking water through Lake Assad (Euphrates River). It has also been misused by ISIS to flood government-held areas in the past. Notably, the vanguard of SAA troops are some 8 kilometers from Al-Khafsa town and held up only 6 kilometers west of ‘Water Facility One’. The capture of Al-Khafsa would not only secure a steady supply of water to Aleppo’s residents but also cut off a large chunk of ISIS territory north of the town from the Islamic State heartland. At the moment, the Tiger Forces have temporarily halted their advancements overnight and are regrouping while rearguard units moved in to reinforce the flanks of the massive government salient. Al-Masdar News field correspondents Ibrahim Joudeh, Yusha Yuseef and Hamza Sulyman contributed to this article. IMHO they water works will and should have priority.